Comment: Missing power cord. Item will come in original packaging. Packaging will be damaged. Save an extra $10.10 when you choose FREE No-Rush Shipping at checkout. 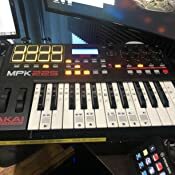 With MPK261, experience the ultimate in playing response from a controller equally suited to studio and live performance scenarios alike. 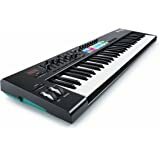 The MPK261 comes equipped with 61 semi-weighted, full-size keys and a premium Akai Professional piano-style keybed for unprecedented response and natural feel. A dynamic, expressive response and faithful capture of every subtle nuance of your performance is guaranteed thanks to MPK261’s velocity-sensitive keybed with aftertouch. 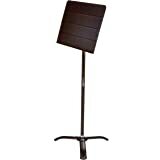 In addition, onboard Octave Up and Down controls allow players to access the entire melodic range – perfect for bass lines, piano harmony, solo leads and much more. Unlock your creative potential and take your performance to the next level with MPK261’s arsenal of MPC controls. 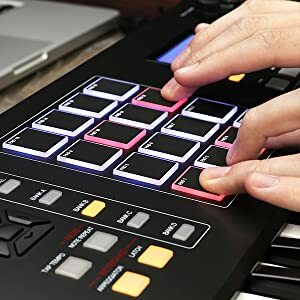 16 conveniently located, velocity-sensitive MPC-style pads with RGB feedback provide the ideal platform for triggering one-shots, drum hits, loops, instrumental samples and more - expandable up to 64 pads via 4 banks. Add further dynamic flair and experience the ultimate platform for immediate creative inspiration courtesy of Classic MPC Note Repeat, Full Level and an on-board arpeggiator, with adjustable resolution, range and patterns, for unrestricted exploration of complex melodic ideas, effortlessly. 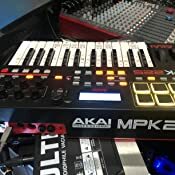 Experience total control of your DAW, virtual effects and virtual instruments with MPK261’s collection of in-demand controls, meticulously engineered for the modern producer and live performer. Combining full transport controls and 24 assignable Q-Link controllers - including 8 control knobs, faders and switches (expandable to 24 of each via 3 banks) – MPK261 seamlessly maps to any assignable parameter for surgical creative control. Plus, with MPK261’s onboard 5-pin MIDI input & output, harness the power of our outboard equipment from a controller designed from the ground up to be the ultimate compact creative centerpiece. 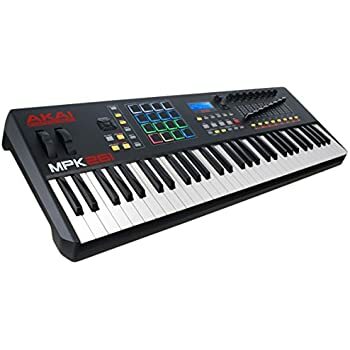 MPK261 comes loaded with core functionality to capture your creativity and pave the way for immersive, expressive performances. Combining on-board pitch bend, modulation and octave controls MPK261 provides critical expressive control in a portable road-tested footprint – plus, with the inclusion of 1 assignable footswitch jack & 1 expression jack, embellish your performances with natural, piano-style sustain or expand your control-source arsenal for unparalleled creative exploration. 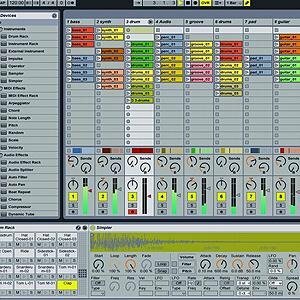 Ableton Live Lite delivers much of the functionality of Ableton Live—the revolutionary, multi-award-winning music production solution that lets you spontaneously compose, record, remix, improvise and edit your musical ideas in a seamless audio/MIDI environment. Live brings your acoustic, electronic and virtual instruments—as well as your digital audio recordings and MIDI sequences—together in a single interface with unparalleled ease of use. With MPC Essentials experience the renowned MPC workflow in an easy-to-use creative program that works as your main DAW or as a plugin in your current DAW. Supercharge your production with a powerful 64-bit music production package featuring up to eight pad banks (for a total of 128 tracks), a 1GB sound library and user-friendly import capability for your own WAV and AIFF samples. Sculpt immersive, expressive sounds and textures layering up to 8 separate instruments and patches per VIP instance; load up to 4 different VST effects per instrument channel to sculpt the perfect sound; put power into your performance with Pad Chord Progressions and user-friendly Key Control processors; and much more. From live performance to studio production, VIP’s user-friendly functionality coupled with a diverse feature set assures simple, seamless integration into your existing setup and provides the ultimate platform for unrestricted creative expression. Experience expanded control of your VST instrument and effect collection with MPK261 and VIP3.1 (Free Download Included). 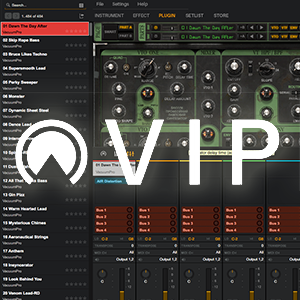 VIP3.1 provides you with unparalleled access to your virtual instrument and effect collection, seamlessly integrating the hardware / software experience and grants the unrestricted freedom to create in a user-friendly, intuitive format. The combination of VIP and MPK261 maximizes workflow and ensures a playing experience that feels natural and enhances creativity – the natural, tactile feel of hardware fused with the unrivalled processing capability of virtual Instruments. 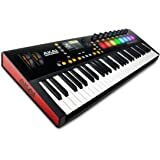 The Akai Professional MPK2 series of performance pad and keyboard controllers are an all-in-one controller solution for studio composers and live music performers. 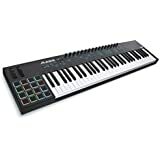 The MPK2 series combines deep software integration, enhanced workflow, and core technologies from the iconic line of MPC workstations with a keyboard for maximum flexibility without complication. 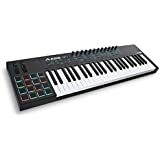 The MPK261 features 61 semi-weighted keys with aftertouch pressure sensitivity; 16 MPC-style pads with RGB feedback; 8 Q-Link knobs, faders, and switches; and onboard transport buttons. Four pad banks expand the number of assignable pads to 64 total, and three banks expand assignable knobs, faders, and switches to 24 each. 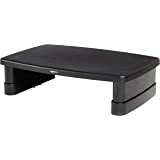 Plus, MPK261 is optimized to interface directly with your Mac or PC with USB power and plug-and-play connectivity. 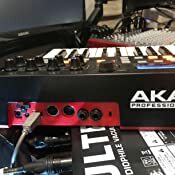 5.0 out of 5 starsLove it, love Akai. I’ll keep this short. 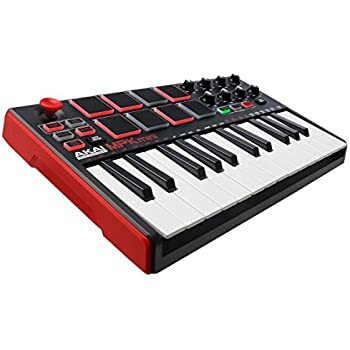 By far my favorite USB / MIDI keyboard I’ve used. 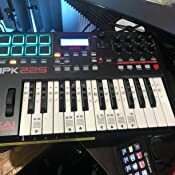 I had tried the cheaper 25 key Akai, but it was just too small and the synth key action I didn’t like. By contrast, this thing is a full sized keyboard. For most electronic music production, you might try a riff or something on the keyboard, test out chords etc., but you’re unlikely to be playing Mozart. Point being, I’d rather a very useful 25 key to a less useful full size 88. 25 is also about as big as fits decently on a desk, especially with a mixer and more. 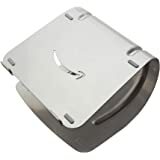 The drum pads are super responsive and sensitive, and 4x8 banks gives you 32 options, though I doubt many use them much - I’d get an MPC or something if I wanted just the pads. They’re there and work very well though. Note repeat is like an arp for the pads as well. Regular arp mode is nice too and well implemented, you can get some cool sounds going by playing with latch and letting the arp bounce around notes. You’ll almost always edit them in a DAW, but it’s a starting point for some cool stuff. The keys feel great, play great, etc., far from the synth action of the cheaper models. Tons of onboard DAW presets plus Ableton Live Lite included is good, too. No support for mixcraft which I use, but no surprise there.. anything common is covered though, and you can make your own presets as well. I do wish there was more variability in the presets - swappable banks like the pads would be nice, since for example if you’re using a VST like serum, there’s a lot of places you can map the knobs - plus if you mod one, changing the mod % is a different knob. 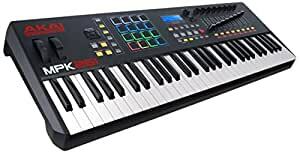 Of course, there’s really not much room, and if I care that much there are MIDI controllers with more options, I even have a 49-key that at least has sliders and 12 knobs, but I still rarely use it, this is so much more preferable. (And yes I keep note stickers on some keys.. never officially learned to play so those are helpful at times). 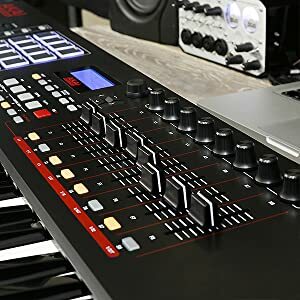 By far my favorite MIDI equipment, would buy again for sure. Also just confirms my love for Akai, I think more Akai products are in my future. This is my first keyboard of this size, and first time using pads, so this is just my impression. I wish the keys were a little more heavy, and I haven't gotten used to using the pads yet. It feels like I really have to slam on them even at the highest sensitivity to get a sound. I really just want to be able to tap my fingers like finger drumming on a desk, but I'm sure I'll learn the muscle memory required. I hadn't fully realize that I'm actually picking up two instruments here and it's going to take a while for me to learn, but the hardware works great other than my little gripes. Comes with a lot of software that I didn't really need, but if you don't have a DAW and a keyboard plugin then it's nice that they include them. 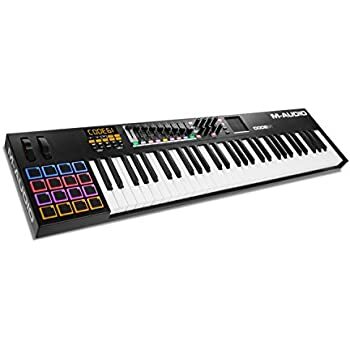 I would definitely recommend fully weighted keys and a full size keyboard, and then maybe just get the drum pad separate IF YOU CAN AFFORD IT. 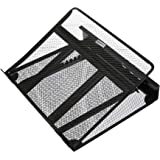 A lot of people I've seen calling people who buy these stupid because it's not full size/weighted. Well it's also 4 times as expensive to do that, so, the choices for me were this or just continue trying to make piano noise with my computer keyboard/piano roll. This works much better. My only qualm (not problem), is that I have to plug it into my iMac directly instead of my power hub. Great device. I use logic pro X and it has a preset for it. I have not had any issues plus it looks real cool too. I would say definitely get this if you use logic pro X, it has been worth the money I spent. 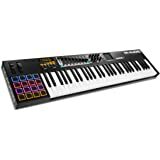 5.0 out of 5 starsAwesome Keyboard - at a great price! This is an awesome keyboard. I use it with my computer and Ableton DAW set up, which I have yet to learn all the intricacies of (so do not ask me set-up questions !) AKAI says the key are "semi-weighted" which I suppose they are, but the action still feels like organ keys to me. The drum touch pads are awesome and 'touch sensitive' the harder you tap - the louder they sound. 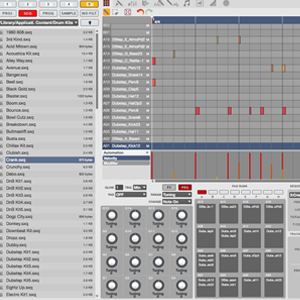 I'm still learning all the capabilities; it comes with a free basic version of Ableton Live. When this keyboard first arrived, it worked extremely well and was very easy to use. I work in the music industry, and the portability and power of this keyboard was great. 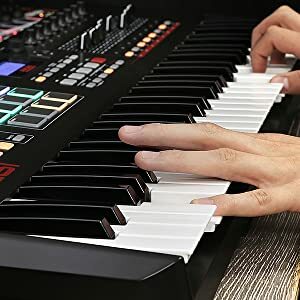 A few months after purchasing the keyboard, the lowest D note started malfunctioning, playing at the highest volume no matter the pressure on the key or sometimes not playing at all. I emailed the Akai staff to ask for help as I had only had the keyboard for a few months. After a full factory reset, they suggested I send the keyboard back to them. I was expected to pay for shipping to them and was told the repairs would take 2-4 weeks (not including shipping). Because I use the keyboard for my work, not having the item for over a month isn't a viable option, and so I've had to play with the broken key since. The rest of the keyboard works great, but I've been disappointed by the help I received in fixing this issue. Don't expect much help when/if your keyboard needs repairs. 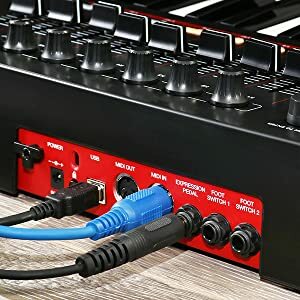 I am using it with MIDI DIN only. The USB port is being used for power. (NB - No wall wart included.) 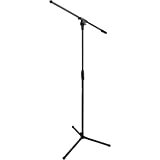 Buy an OnStage pedestal stand and you will be styling. <g> Highly recommended. I brought this for my boyfriend as his Christmas gift and he is in love with it, i don't regret buying this product for him!